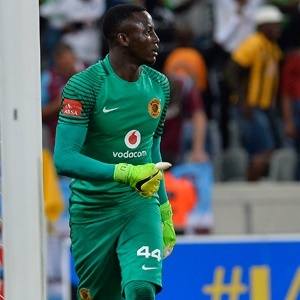 Cape Town - Kaizer Chiefs coach Ernst Middendorp says goalkeeper Bruce Bvuma must try to remain grounded following his surprise inclusion in the recent Bafana Bafana squad. Bvuma was considered to be third choice with Chiefs even with Itumeleng Khune out with injury until the end of the season. Virgil Vries was initially roped in to replace Khune however was dropped after a number of high-profile howlers. Daniel Akpeyi was brought in from Chippa United, yet he also made a major blunder and was dropped. Bvuma then played on 9 March and kept a clean sheet against Maritzburg United before impressing again in the next game versus SuperSport United. Bafana coach Stuart Baxter then selected the 23-year-old as his third choice for the 2-1 victory over Libya last Sunday. Middendorp said: "I only have to check now with him, you know at this time you get a lot of new friends and new interest from brothers, uncles, and new people coming to the market. "And then you probably get carried away, so it's important now for him to keep his feet on the ground, not to fly around and catch butterflies, and make sure he is solid and concentrated to his job. "Otherwise, it's good for him, he had a good experience and that's all. I'm very happy that he's back and not having any injuries, which is important for me right now. "These last four weeks have been like a dream for him, hence it's important to reiterate, 'Stay on your feet. Don't catch butterflies. Don't be with new friends. You will be surprised by what's coming.' And that's the most important stuff, that he has to get his attitude right." Bvuma is likely to start when Chiefs take on Cape Town City in Sunday's Nedbank Cup quarterfinal at the Mbombela Stadium. Kick-off is at 15:00.